Don Cornelius, Nina Simone, Gossip, Major Lazer, Sisqo and more. Night 2 set by Oli Doboli representing Croatia at Mod Club in Toronto, Canada. 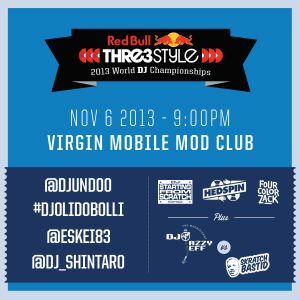 This mix was recorded live on the Night 2 of the Red Bull Thre3style World Championships 2013 in Toronto, on Nov 6th, 2013. Four nights of preliminary competition are held Nov 5-8th with the winner of each night earning a spot in the Finals, on Nov 9th at The Kool Haus, where they will compete for the title of World Champion. True to himself, big up!